Beautifully detailed posey of 3D roses. Acrylic. Various colours available. The posey measures 2.5cm/25mm (widest part). Length 6.5cm/65mm. Pierced ears. Pretty bird with flower earrings. Acrylic. Various colours available. The bird's and flower measure 3.8cm/38mm (widest point). Total length 5.5cm/55mm. The posts are for pierced ears and they do come with bullet style backings. Nickel free. Pretty sinuous bow earrings. Acrylic. Various colours available. The bows measure 2.5cm/25mm (widest part). Length 5cm/50mm. Pierced ears. The posts do come with backings. Nickel free. 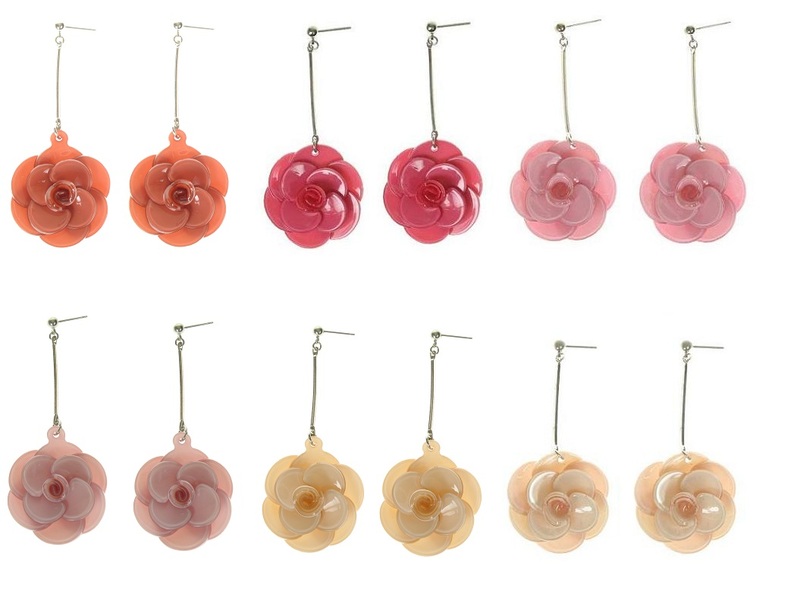 Beautifully formed 3D 'Rose' flower earrings. Acrylic. More colours available in 'Set 2'. Flower measures 3cm/30mm diameter. Total length 7cm/70mm. Rhodium silver plate - nickel free. They do come with bullet style backings. 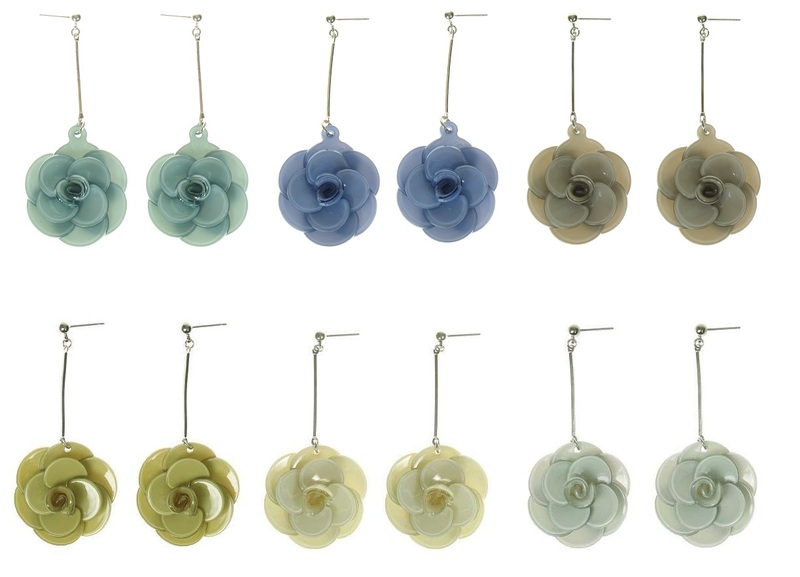 Big Baby beautifully formed 3D 'Rose' flower earrings. Acrylic. Various colours available - more shades available in 'Set 1'. Flower measures 3cm/30mm diameter. Total length 7cm/70mm. Rhodium silver plate - nickel free. They do come with bullet style backings. Big Baby beautifully formed 3 Petal flower, cupped in shape with a 3-D rose style centre, flower earrings. Acrylic. Various colours available. Flower measures 3cm/30mm diameter. Total length 6cm/60mm. Rhodium silver plate - nickel free. They do come with bullet style backings. 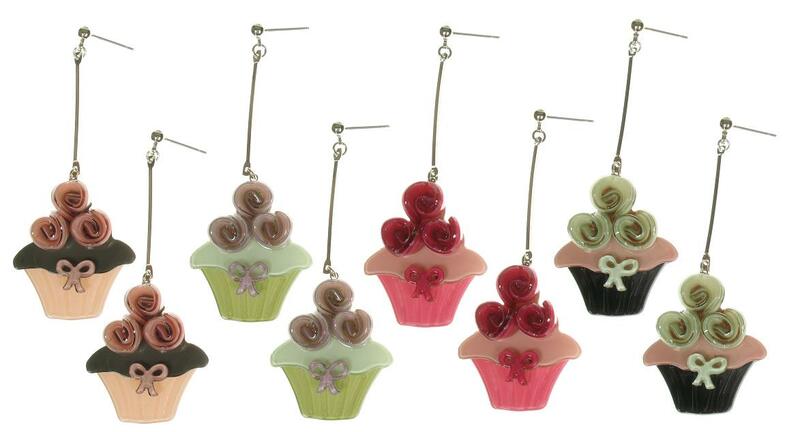 Big Baby beautifully formed rose topped cup-cake earrings. Acrylic. Various colours available. The cup-cakes measure 3cm/30mm diameter. Total length 6cm/60mm. Rhodium silver plate - nickel free. They do come with bullet style backings.